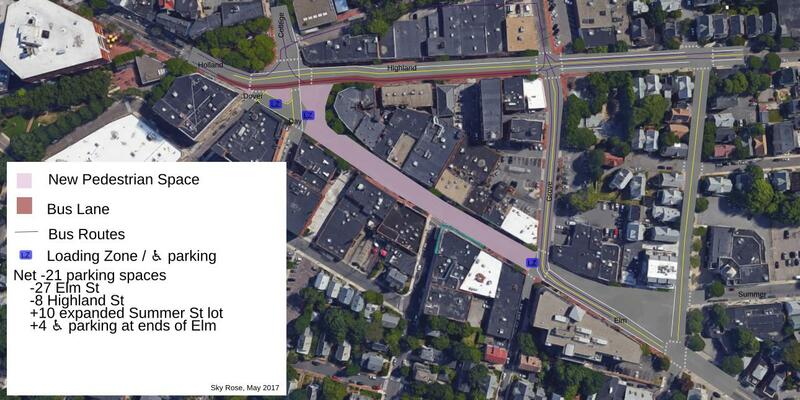 What are your thoughts on this sketch of what Davis would look like with Elm St turned into a pedestrian-only area? Deliveries could drive through during off peak hours. Buses would get a huge boost with the bus lane and better symmetry and turnarounds. I'd especially like feedback on bikability. I didn't manage to fit bike lanes in anywhere, and we'd lose the door zone lane on Highland, but that'd be made up for by having a smaller slower intersection. Perhaps bikes could also share the bus lane? Would a 2-way cycletrack through the pedestrian area be too disruptive? Without addressing the specifics of this proposal, I'll note that most places that have turned downtown streets into pedestrian plazas in the last few decades have come to regret it and turned them back into streets, because it's terrible for businesses. Also, that's a hell of a lot of traffic to reroute onto Highland and Grove.